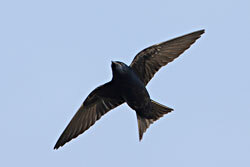 The Purple Martin is the largest North American swallow. Adult males are purplish-black and darker on the wings and tail. Females and immatures have dusky throats, light bellies, and dull purplish-black upperparts. Purple Martins are quite common in Houston's suburbs and rural areas. The first martins arrive in Houston generally in mid-January. The scouts, who are primarily older males, come first followed by younger males and then the females. Nesting activities start in February. Both sexes build a nest composed of grass, leaves, twigs and other convenient materials such as paper and string. Four to five slight glossy white eggs are laid from mid-April through May. Incubation takes 15-20 days. Females do most of the incubating, while males assist in feeding duties. The young remain in the nest for 24-28 days. Families stay together for 3 weeks afterwards. Martins are generally single-brooded unless no chicks survive. In July and August, Purple Martins congregate in large flocks before departing south in the fall. All Purple Martins winter in South America. 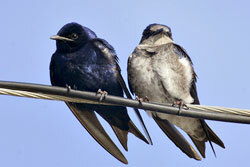 Invite Purple Martins to Your Yard! Purple Martins prefer yards that have a source of water nearby (swimming pool, pond, lake, etc). They feed mainly on day-flying insects, including beetles, wasps, dragonflies and mosquitoes. Martins do not use feeders but are known to appreciate crushed bits of eggshell put out on a flat surface. Houses are very effective in attracting martins. Houses should be placed where at least on three sides they are not close to large structures or trees. The ideal martin house should be lightweight, cool, attractive, durable and resistant to parasites. The exterior color should be white to reflect heat. It should have guard rails to protect young birds and bright interiors to discourage starlings. The best compartment size is 6" x 6" x 6" with the hole 2 1/8" in diameter. The house should have good ventilation and drainage with sub-floors to discourage mites. A good way to discourage parasites is to scatter 1 tablespoon of powdered sulfur in each compartment just prior to nesting. Martin houses should be located in an open area with at least 15 feet clearance from trees and buildings. The pole should be 12 to 20 feet in height, with some sort of mechanism to lower the house for cleaning. Poles should be equipped with predator guards to protect against cats, squirrels, raccoons and other nest-robbers. To discourage house sparrows, keep the compartments cleaned of nest material before the martins arrive. In addition, door plugs should be used on the compartments in the off season. Gourds: Gourds, both natural and plastic, make excellent housing for martins. Research has shown that martins using properly prepared and mounted gourds have higher reproductive success than with conventional houses. The fact they swing is something martins like and predators don't. Also their shape discourages predators. New plastic gourds snap together to make cleaning easy. Gourds attached to the bottom of regular houses may increase your chances of attracting martins.